The Green Bay Packers visit the Pittsburgh Steelers in Week 12 of the 2017 NFL season. PFF previews the top player matchups of the game. 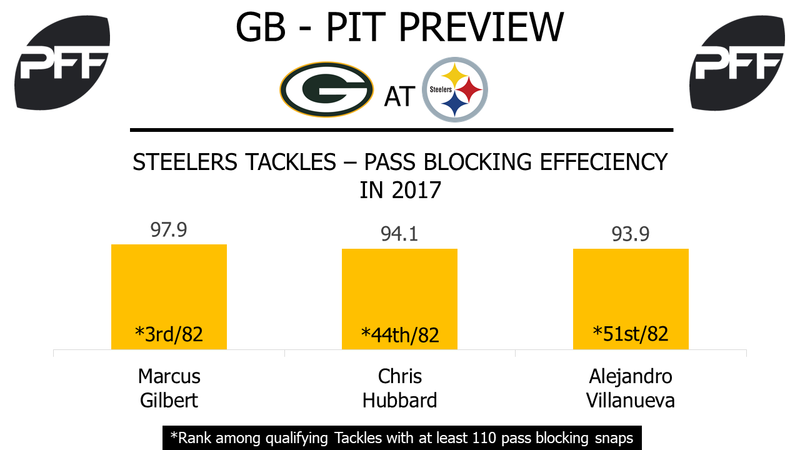 QB Brett Hundley vs. Steelers pass rush – Hundley has struggled in place of quarterback Aaron Rodgers this year. His PFF overall grade of 67.5 ranks 33rd among quarterbacks. One of his biggest weaknesses has been his ability to throw under pressure. He’s completed only 41.1 percent of his passes and has a passer rating of 40.6 when faced with pressure. Conversely, he has a 71.6 percent completion rate and a 75.7 passer rating when he doesn’t face pressure. The Steelers have applied 215 pressures this season, which is second-most in the league. In addition, they’ve forced pressure on 52 percent of their blitzes. RB Jamaal Williams vs. LB Vince Williams – Jamaal Williams posted a PFF overall grade of 73.1 in his first career start last week. He forced one missed tackle and averaged two yards after contact per rushing attempt. In addition, he allowed a sack and a hit on 10 passing snaps. This week, he might often be utilized in pass protection against a Steelers’ defense that’s blitzed on 31 percent of passing snaps. Linebacker Vince Williams is Pittsburgh’s most efficient pass-rusher. He’s forced 14 total pressures and he ranks second among linebackers with a pass-rushing productivity of 26.1. 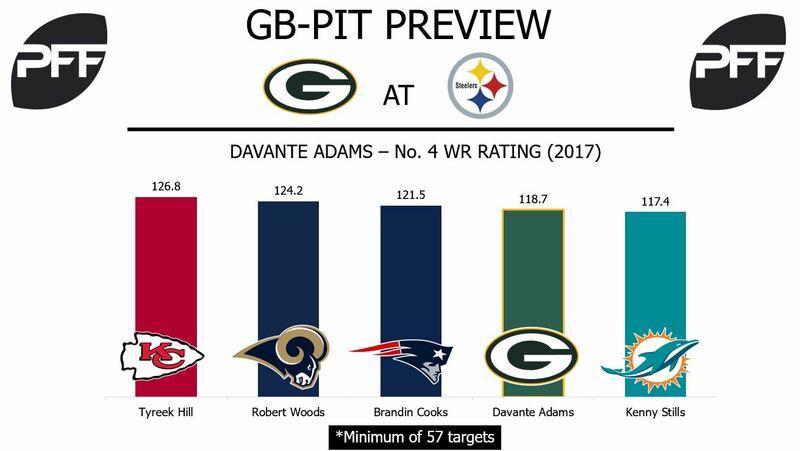 WR Davante Adams vs. CB Coty Sensabaugh – Adams has been the Packers’ top pass-catcher throughout the year, earning a wide receiver rating of 118.7. Since Hundley took over the helm in Week 6, Adams has caught 12 passes for 174 yards and a touchdown when lined up outside to the right at the snap. Sensabaugh has played 65 of his 70 coverage snaps as the left cornerback over the past two weeks. In his two starts, he’s allowed 1.65 receiving yards per coverage snap. Quarterbacks throwing to a player in his coverage have averaged a passer rating of 82.1. WR Antonio Brown vs. Packers cornerbacks – Brown is coming off his sixth game of the season with 10 or more targets. At 91.1 overall, Brown is PFF’s only elite graded receiver this season and he has become the first receiver to reach 1,000 receiving yards in 2017. Whenever Ben Roethlisberger is blitzed this season and targets Brown, his passer rating is 121.4 on 28 targets with three touchdowns. But Brown has not been able to make defenders miss like he did in the beginning of the season. Through Week 5 he was second in the league with seven missed tackles forced but from Week 6 till now, Brown has only managed to force one missed tackle. He’ll be facing a group of cornerbacks that as a group has allowed a passer rating of 111.1 when the team has blitzed this season. And they have combined to miss 15 tackles after the catch this season. G David DeCastro vs. DI Mike Daniels – DeCastro enters Week 12 as one of only two offensive linemen, Jason Kelce being the other, to grade at an elite level this season. The Steelers’ guard has played 367 pass-blocking snaps this season without allowing Roethlisberger to get hit or sacked. Only missing seven snaps since the start of the 2014 season. DeCastro’s 91.3 run-blocking grade ranks third among all offensive lineman in 2017. While Daniels has lined up all along the defensive line this season, his most productive position has been lined up over the right guard. That’s where seven of his 21 total pressures have come from, the most at any position. He also has yet to miss a tackle in the run game on his way to 14 run stops this season.